Mark your calendar for November 16 for the Radio Club of America’s banquet. The affair returns to the New York Athletic Club where the banquet has been hosted for the past 25 years or so. 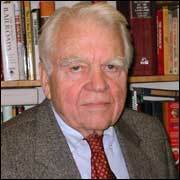 Andy Rooney, known for his essays on the CBS News program “60 Minutes,” will deliver the keynote speech. 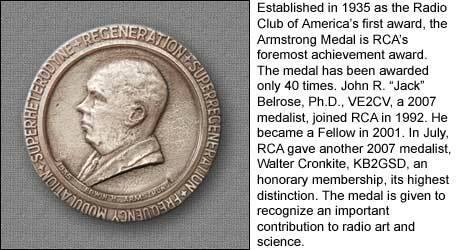 Walter Cronkite, KB2GSD; and John S. “Jack” Belrose, Ph.D., VE2CV, will receive the Armstrong Medal. 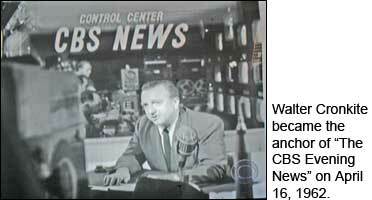 Walter is best known as the anchor of the “CBS Evening News” from 1962 to 1981. Jack is an emeritus researcher at Communications Research Centre Canada. I telephoned Jeanne Hammond to tell her the news. Jeanne is the niece of Maj. Edwin H. Armstrong, in whose memory the medal is given. She said she was excited to know that the medal, which is not given every year, would be awarded to Walter and Jack, and she said that Andy Rooney is a longtime favorite of hers. For many years, Jeanne used to attend the banquet when she was a guest of the late Frank Gunther, a former president of the Club. Armstrong served RCA as its president from 1916 to 1921, and he continued to serve for 20 years or more as a director. Armstrongs devotion to RCA is clear, and he has many admirers among Club members to this day. Armstrong is known in particular for four patented inventions: the regenerative receiver, the superregenerative receiver, the superheterodyne receiver and frequency modulation. The last two continue to underpin modern radio communications, wireless telecom and broadcasting. The four inventions are named in concentric lettering near the edge on the medal’s face, as shown above. Rooney has written a national newspaper column for Tribune Media Services since 1979. Among the 14 books he has written, the most recent is Years of Minutes, published in 2003 by Perseus Books. RCA gave its highest distinction, honorary membership, to Walter in July 2007. In its history, RCA has conferred only 27 honorary memberships. The only other living honorary member is June Poppele. Her father, Jack R. Poppele, was one of two engineers who, in 1922, started what now is New York’s WOR AM radio station. Among previous honorary members were David Sarnoff, the long-time president of the Radio Corporation of America  the other RCA  and Paul F. Godley, 2ZE, a participant in the first transatlantic communication by amateur radio. Among his other interests, Walter is a radio amateur. He said that although amateur radio has been around for 100 years, it is not out of date. Many of you know Im a sailor. I really enjoy being on the sea, with the wind at my back, under way, under sail. What most of you dont know is that Im a radio ham, too. My call is KB2GSD. And you can bet that when Im on the ocean, even if the GPS, the radar and the ship-to-shore fail, Ive still got my ham radio station. It really is the best back-up communications system in the world, he said. Walter was born in St. Joseph, Missouri, in 1916. He first worked in radio as an announcer for WKY in Oklahoma City. He later worked as a sports announcer for KCMO in Kansas City, Missouri. While in Kansas City in 1937, he went to work for United Press International (UPI). 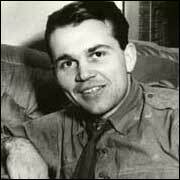 The news agency sent him to cover World War II, and he distinguished himself as a reporter in North Africa and Europe. On April 16, 1962, he succeeded Douglas Edwards as the anchor of the CBS Evening News and continued in that role until March 6, 1981. On Nov. 4, 1981, Walter would be 65, and at the time CBS enforced mandatory retirement at that age. Dan Rather succeeded him in the anchor role. But why did the Conkite era end prematurely? 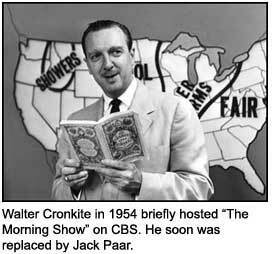 After leaving the evening news broadcast, Walter was seen and heard occasionally as a special correspondent for CBS, CNN and NPR. From 1987 to 1992, Walter filled his last role for CBS News: “Walter Cronkite’s 20th Century,” a 90-second daily historical radio segment for CBS Radio. A production company he co-founded in 1993, the Cronkite Ward Company, produced documentaries for the Discovery Channel, PBS and other networks. CBS, PBS and Roth Talent Associates put the number of documentary hours produced in a range of 25 to 100. In 2004, he wrote a weekly syndicated newspaper column that appeared in 186 newspapers. He has recorded voiceovers and narration for a variety of projects, and his voice can be heard introducing Katie Couric at the beginning of daily broadcasts of “The CBS Evening News. For many years, Walter hosted the annual Vienna New Years Concert on PBS and the Kennedy Center Honors. Walter is the recipient of a Peabody Award, the William White Award for Journalistic Merit, an Emmy Award from the Academy of Television Arts and Sciences, the George Polk Journalism Award, and a Gold Medal from the International Radio and Television Society. His autobiography, A Reporters Life, was published in 1996. Jack is one of RCA’s most distinguished members. He received BASc and MASc degrees in electrical engineering from the University of British Columbia, Vancouver, B.C. 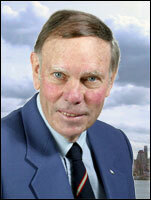 He joined the Radio Propagation Laboratory of the Defence Research Board, in Ottawa, Ontario in 1951. He received his PhD Cantab degree from the University of Cambridge in radio physics in 1958. From 1957 to 1998 he was with the Communications Research Centre Canada (formerly Defence Research Telecommunications Establishment). When he retired, he was director of the Radio Sciences Branch. In honor of a 50-year career in radioscience, he has the status of an emeritus researcher at CRCC. Jack was deputy chairman and then chairman of the AGARD (Advisory Group for Aerospace Research and Development) Electromagnetic Propagation Panel from 1979-83. He was a special rapporteur for ITU-Radiocommunications Study Group 3 concerned with LF and VLF Propagation, and in this capacity authored two major reports concerned with propagation in these frequency bands. Since 1981, he has been a technical advisor to ARRL in the areas of radio communications technology, antennas and propagation. Belrose is a life member of the Antique Wireless Association and the Quarter Century Wireless Association and a life senior member of IEEE (Antennas and Propagation Society). 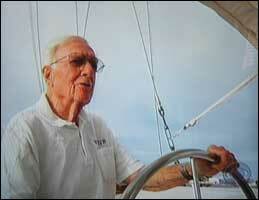 He has been a licensed radio amateur since 1947  present call sign VE2CV, ex-VE7QH, ex-VE3BLW. He is the author or co-author of more than 150 papers, articles, and technical correspondence letters written relevant to the fields of radio communications, radio science, antennas and propagation; author of two chapters in a Prentice-Hall book Physics of the Earths Upper Atmosphere; author of a chapter in an IEE 1983 publication The Handbook on Antenna Design; lecturer, AGARD Lecture Series and director for four published lectures; author of five papers concerned with the history of wireless and a chapter of History of Wireless published in 2006 by John Wylie & Sons. In recent years, Jack said, I have been concerned with research in the field of computational electromagnetics (antenna problems). Since 1992, researching the history of radio, I have written a number of papers promoting the recognition of the contributions of Canadian born Reginald Aubrey Fessenden (1866-1932) to the development of radio, he said. 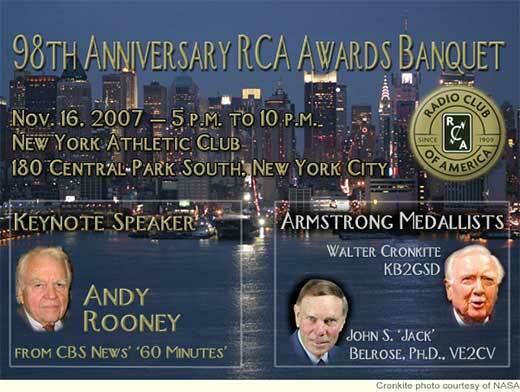 RCAs banquet will be held at the New York Athletic Club, 180 Central Park South, New York, NY 10019. The banquet is open to members, non-members and guests. For reservations, contact RCAs headquarters: Radio Club of America, PO Box 621074, Littleton, CO 80162; tel. 303-948-4921. This entry was posted on Sunday, August 26th, 2007 at 9:00 am and is filed under RCA meetings. You can follow any responses to this entry through the RSS 2.0 feed. You can leave a response, or trackback from your own site.